Amazing! Frank was patient and listened to my ideas and dreams and made my wedding magical. He is so sweet and from the moment I entered the shop I knew I made the right choice with him. Oh, and my mother simply loved his designs. 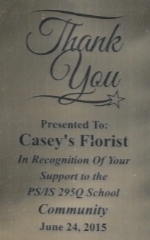 Never a disappointment from Casey's Florist & Decorations. Their prices are the best in the area of Long Island. The arrangement they gave me was more then I expected, beautiful, and amazing. Every time I made an order it was always exclusive. Its never copied. The designer is amazing his work is the most beautiful thing I've ever seen. They also do weddings and sweet sixteen and more. The arrangements they do for those kinds of things are incredible for the price they give you, the best I ever seen. I'm very sure this is the best shop you will ever go to. EXCELLENT! Excellent!! They do an amazing job!! Never disappointed!! I used Casey's Florist for my wedding last Sunday. The floral arrangements were absolutely phenomenal. My guests were amazed by the quality of the floral decor. I received plenty of compliments. From the boutonnières and corsages to the table arrangements, the designs and flowers were immaculate. Frank has a great vision. He was organized, prompt, courteous, reasonable and very professional. He also provided a lot of extras that enhanced the look of the flowers. If he didn't have an item I needed in his shop, he was gladly offered to get it. His prices were reasonable. His work and customer service greatly exceeded my highest expectations. If you are in the market for a florist, I highly recommend...with no hesitations. He really helped me bring my dream wedding to fruition. We used Caseys for our wedding. We received so many compliments on everything that they did! We had something special in mind for center pieces and were also having an outdoor ceremony. They made up a sample for us so we could see what it would look like. It exceeded every expectation. This is a family business and you can tell that they love what they do. I would never go anywhere else and would recommend them for any event. True professionals with great customer service and amazing talent!!! Casey's florist & Decoration was able to bring to life the Vintage Español country Ceremony we envisioned. With such gorgeous arrangements (people are still talking about them) and with the white petals lined the aisle, making a beautiful sight for my walk down. Frank the Decor certainly delivered exactly what we had discussed. Every bride should feel like I did when I held my bouquet, I feel it was the prettiest one i've ever seen. Frank used his creative expertise to take our ideas steps further to create our arrangements that were truly spectacular. White Callalily's orchids in the branch with white hydrangea in the ring of the vase, and the Second arrangement had branches with white hydrangea in the ring with hanging candles and crystal gliding your face. I was overwhelmed with great joy when I saw how he decorated the gazebo with white flowers centerpieces. It was a pleasure working with Frank and his wonderful ideas, the flowers are what truly complimented the venue. If you are planning an event, and want it to be everything you vision Casey's Florist & Decoration is your pick! I loved my centerpieces at my wedding. Franklin and his children were so nice to me. They were so patient with me even when I was bridezilla and accommodating. I highly recommend to all my friends and family. Franklin did beautiful job!!! My husband and I used Casey's Florist for our wedding and reception decorations on May 19, 2018 and we were extremely satisfied with the quality of work delivered that day. We received so many compliments from our guests on how exceptional the flowers and decorations were. I am extremely detail oriented and meticulous when it comes to all aspects of a wedding and Frank significantly exceeded my expectations for the event. During the entire process we had a number of requests and Frank listened patiently and carefully to everything that we requested. He also made great suggestions for the décor which clearly demonstrated his talents and creativity as a florist/decorator. The pricing was also reasonable for the quality of the work and everything was delivered on time and his team worked very efficiently. We would highly recommend using Casey's Florist for any wedding or event. Thank you Frank for making our wedding day so spectacular and special to us.